It's been such an honor to have had one of my layouts chosen as the Swirlydoos Layout of the Year and even more of an honor to be invited to be April's Guest Designer! And what a gorgeous kit I've been given to use - Purple Haze, full of Blue Fern Studios papers and flowers and embellishments from Kaisercraft, Prima and Tim Holtz, and oh! that embroidery hoop! To top it all off, I've been using all of the add-ons: coordinating cardstock, extra pattern paper, gorgeous flowers, even more embellishments, fun mediums and best of all, brand-new air dry paper clay and those amazing silicone moulds from IOD! For my first layout, I not only used the Blue Fern Studios chipboard that came in the Embellishment add-on, but I took out an old BFS stamp and lightly applied it to a bit of the packaging that I tore here and there. The chipboard was painted with the Prima Metallique acrylic that came with the Tech add-on and the fun Kaisercraft wood embellishments were colored with the Ken Oliver Liquid Metals from the Mediums kit. Me and the sibs a few years ago. Somehow, we never think about a group shot when we're together. My niece decided that it was past time that we did and took this wonderful picture of us all. 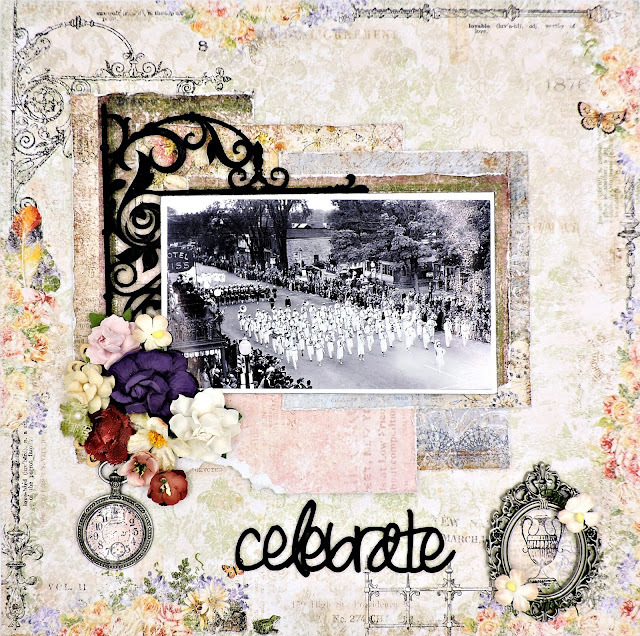 The Lane Street Sign chipboard from Blue Fern Studios and the Tim Holtz embellishments that came in my shipment put me in mind of this photo of Small Town America - the 1938 Apple Blossom Festival Parade going up Main Street in Le Roy in western New York State. I kept it all pretty simple, with some layering under the image and a selection of the gorgeous flowers from this and the February kit. 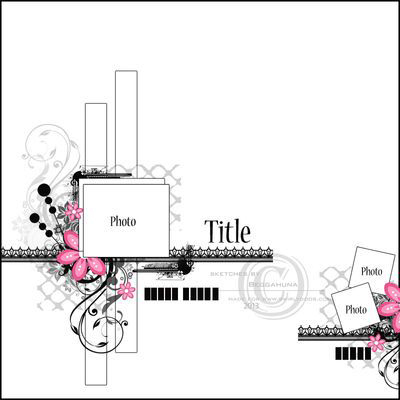 The pastel colors, the gorgeous images of flowers and butterflies - not suitable for a boy page, right? Wrong!!!! The pop of red from Kaisercraft sheet that Krissy included with the pattern paper changed the tone completely!!! 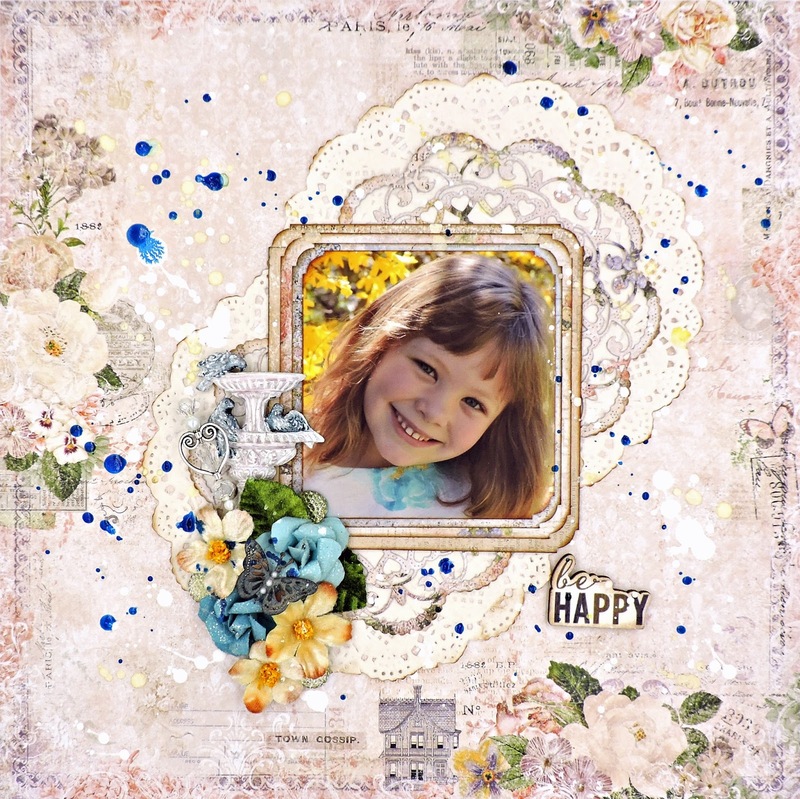 I've kept it all pretty simple, with distressed layers, those fun Tim Holtz hearts from the Embellishment add-on and the Prima vine from the March Flower kit. 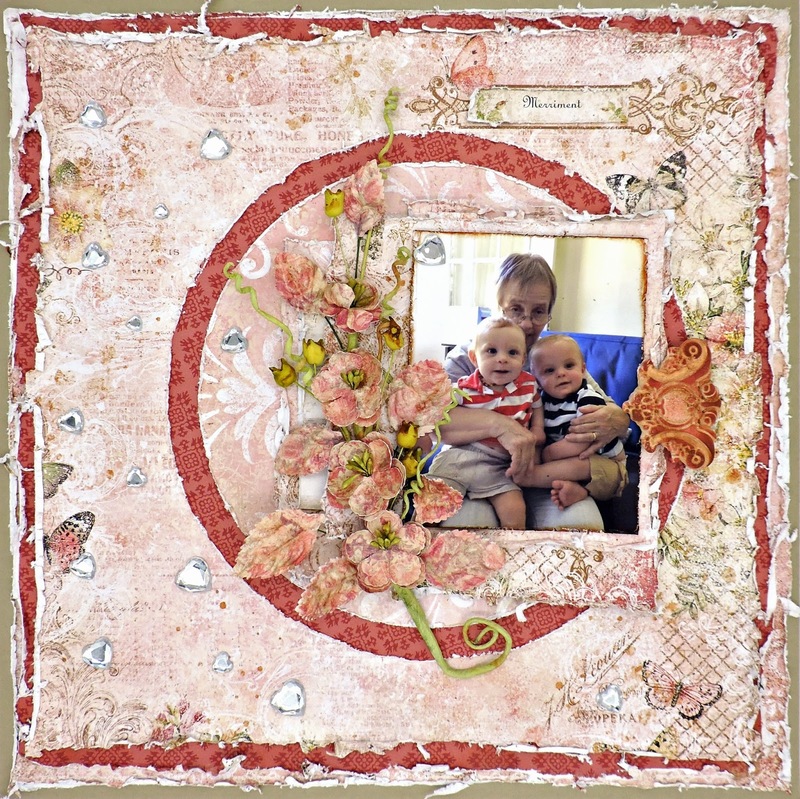 The embellishment on the side of the photo was made with the Tech add-on, colored with Fired Brick Distress Ink and toned down with Prima Artisan Powder. I discovered this photo last week while looking for something else. That's me and the grandsons two years ago; how they've changed!!!! Again, I've kept it simple - a couple of doilies from M's, a couple of die cuts using the aptly named Sophia's Heart die from Cheery Lynn, flowers from the gorgeous add-on, the resin birdbath from the main kit and the last of my RAK from Angelica's Little Scrap Shop. Oh, and lots of splatters using inks and Cindy's water + gesso recipe. Last (but not least), I colored one of the wood butterflies with a bit of the Shimmerz Aqua Huez and added a bit of the Darice pearl trim from the main kit. Sophia out back among the forsythias, wearing her Easter dress. This layout worked better with a close-up; I've put a few more detailed images aside for "later". My take on this month's sketch by the remarkable Beggahuna takes full advantage of the blend of purple and blue in this sheet of pattern paper. I've done a bit of stenciling and I've used one of my Cherry Lynn dies - Fanciful Flourish.. I've also dug very deeply into my stash for the Basic Grey chipboard alphas of my title. A bit of explanation, if I may... Hurricane Irene, Superstorm Sandy and a few extreme Nor'easters have cut down a lot of the trees in my complex. To me, the saddest losses of all have been the Dogwoods. I've always looked forward to the many trees in full bloom at the beginning of Spring. The groundskeepers have put in some heroic efforts to save what they can, but I was surprised that this one was merely cut back to the center trunk instead of cut down entirely. Last year, it was totally bare and by all appearances unable to last through another bad storm. Well, the groundskeepers were right - I took these photos of this amazing survivor last month! When I opened my kit and started the ritual petting and planning, the embroidery hoop that Krissy sent us immediately caught my eye. One quick look at the IOD Moulds that were included in the Project add-on and this idea began to form. As soon as I finished sorting all of the papers and embellies, I took out the air-dry clay and the Baroque 6 Mould and went to work, never considering a tutorial. By the time Kim and I started discussing what I'd be doing, this wall hanging was complete. I did write up a step-by-step. 1. Place the embroidery hoop over the pattern paper, positioning it so that the image you want is perfectly aligned. Be sure that the hoop mechanism is on top. Trace around the outside with a pencil. Put the paper aside for now. 2. Fill the long design on the right edge of the mould with paper clay, making sure that the mould is filled tightly and that the clay is even on top. Carefully remove the clay. It will be pliable enough to allow you to do this; just be slow and patient. Do this two more times, so you have a total of three pieces. 4. Wrap the seam binding around the hoop, fastening with the hoop mechanism. You want to bind your clay as firmly as possible, without it so tight that it will mar the design. Make sure that the hoop is laying so that the flush edges are on the bottom. 5. Allow to set overnight. You'll find that your clay has seriously shrunk. No worries - we'll take care of that later! Turn the hoop over; you'll notice that the clay is still moist. Let it sit for a few more hours until thoroughly dry. 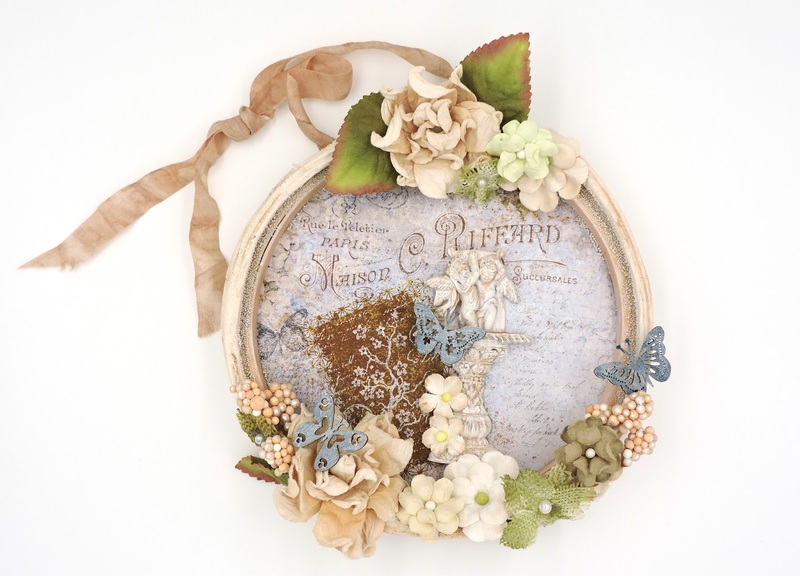 Carefully undo the seam binding and remove your molded pieces from the embroidery hoop. Put them to the side to thoroughly dry in the middle, for about an hour or so. 6. Find the place on the pattern paper that you want to use your rub-on and adhere. Sprinkle a small amount of the Artisan Powder over the adhesive and tap to remove all excess over your craft mat. 7. Add a small bit of water to the Artisan Powder and lightly ink the inside and top edge of the embroidery hoop with the paint brush. 8. Adhere the clay pieces to the hoop with the 3-D gel, using the groove that was formed when you first fitted the clay while wet. You'll want to start with your bottom piece, then the sides, trying to get the edges pretty close together. You won't get a perfect match and the top edges will end near the beginning of the metal on top, leaving a sizable gap, about an inch. You will also find gaps around the top. These will be taken care of in the next few steps. 3-D gel dries pretty quickly. You'll have enough time to play around a bit, but it all should be dried and firmly adhered in 30 - 60 minutes. 9. Sprinkle out a small bit of the Artisan Powder. Using a soft dry brush, spread and pounce the powder on the clay until you get the look you want. Apply a bit more to your resin piece. You'll be using the left over powder, so you can let it sit there on your craft mat. 10. Adhere the paper to the hoop with more of the 3-D gel and let sit for a few minutes to set. 11. Brush a small amount of the 3-D gel around the hoop wherever you see a gap. Sprinkle with the mini Art Stones. Keep repeating until all gaps are covered. Next, go here and there around the edges of the paper adding a bit more 3-D gel and Art Stones to give your design a bit more texture. 12. Adhere the resin piece to the paper. 13. Time to fill in those bothersome gaps! And that's why we buy our flowers, right? Place them around your frame, again using 3-D gel, covering all the holes. I've glued a large leaf on one side where the clay pieces meet and a few blooms on the other. That large gap on top is totally filled in with another flower cluster. 14. Color a few butterflies with the Shimmerz Huez and place them along with a few small blossoms around your wall hanging to complete. 15. Spray the left over Artisan Powder with a bit of water. Moisten the seam binding and place it in the wet powder, turning it over until thoroughly colored. Dry with your heat tool. Adhere to the back of your hanging with 3-D gel about 1 inch down and 3 inches across. Cover that with a piece of packaging, making sure that this is glued down thoroughly. Roughly knot the loose edges to complete. I seem to be mention 3-D gel a lot. It's a very strong adhesive that can be spread very easily, which makes it ideal for gluing on all sorts of embellishments as well as all of the bits of texture that we're playing with lately. It seemed to be the best choice for the paper clay as well as the art stones. It's a bit pricey, but a little goes a long way. You may notice that the seam binding is adhered in the back of the piece, rather than between the clay and the hoop. The entire piece weighs in at 4-3/4 ounces, enough to make me think that this was the best option. I can't wait to see what the rest of you do with this amazing kit and all of the fun - and gorgeous - add-ons!!!! Peggy.. welcome to blogland!!!! So nice to see you've got a blog! And congrats on being a Swirlydoos Guest Designer this month! You have created some beautiful pieces, I especially love your 'red' layout with the gorgeous vine on it and your very pretty Hoop Wall hanging! Awesome! Wonderful work for your first post. I really love the clay molds around the hoop. Genius! tfs. You blog is awesome, Peggy! I love all of your creations! Congratulations, again, on being Guest Designer this month! Awesome, Pegs! LOVE that you have a blog! And, congrats on being a guest designer. You deserve that honor! Hugs! Awesome Peggy. Love all your projects and the blog looks great. Way to go Peggy, great blog! !